It is time for the last list of 2013. It was a good year of music. Here are my favourite pop singles of the year. Karise Eden won The Voice Australia last year and launched her first self-written single ‘Threads Of Silence’ a while later. The song is a heartfelt piano ballad where she shows the strength of her vocals in the big chorus. It kind of reminds a bit of Adele’s more stripped down tracks, which is obviously a compliment. Impressive debut! Tom Odell launched his career successfully with the beautiful and heartbreaking single ‘Another Love’. The lyrics are touching and definitely relatable and Odell’s delivery is heartfelt. The moment where the second verse kicks in, always gives me goose bumps. Those lyrics are so honest and powerful. What a song people, what a song! Laleh had to follow up the huge success of ‘Some Die Young’ and the album Sjung. She came back with a single and album called Colors. The single is not miles away from the sound ‘Some Die Young’ has, but it is even more catchy and a little bit more uplifting. Her style of both her voice and her writing are distinctive and ‘Colors’ is a typical Laleh track in that sense. Absolutely nothing wrong with that! I have never been a big fan of Céline Dion, but in collaboration with Sia, she managed to create on of the best singles of the year. ‘Loved Me Back To Life’ is a ballad with a modern sound and of course Céline’s voice sounds strong and emotional. For Sia, it was one of the many successful jobs as a writer for other artists. They should work together more often, because Celine’s voice fits this type of songs perfectly. Lorde, the young singer from New Zealand, was one of the biggest discoveries of the year. While her song ‘Royals’ turned out to be a worldwide hit, I still think ‘Tennis Court’ is her best track. Everything is so on point here: her distinctive vocals, the fresh production, the honest lyrics and that undeniably catchy melody. Such a smash! This Swedish young woman came seemingly out of nowhere with one of the best pop tracks of the year. ‘Habits’ was her first single, but the heartbreaking character of the lyrics in combination with that immensely strong chorus is such an event to listen to. She showed she has more up her sleeve with single ‘Out Of Mind’ that almost made this list as well. Welcome Tove, you are one of my favourite pop stars from now on. Cassadee Pope won The Voice USA last year and followed her mentor Blake Shelton’s path and started to make country music. Her first single ‘Wasting All These Tears’ is a big pop/country belter, that you could expect from the likes of Carrie Underwood as well. It is a brilliant song with a huge chorus and strong lyrics. Cassadee has such a beautiful tone to her voice which makes this song all the more special. Famous Italian pop star Marco Mengoni won the San Remo Festival and represented Italy in Eurovision with the beautiful ballad ‘L’Essenziale’. The lyrics are touching, the melody is beautiful and Mengoni has got a distinctive and incredible sound of voice. Who does not melt when he sings in Italian about how he would create new places for you when your world falls apart? Lovely! Birdy came back swinging this year. She left behind the piano covers and presented a different sound with the single ‘Wings’. It is such a good song with a melancholic atmosphere, beautiful lyrics and one hell of a strong chorus. Birdy’s soaring vocals top it all off. This single definitely shows her potential as an interesting pop star. ABBA’s Agnetha Fältskog made a comeback with new original material. She released the beautiful song ‘When You Really Loved Someone’ as the first single. It is a traditional pop ballad with a quite modern production. The lyrics about losing the love of your life are simple, but really effective and Agnetha gives them more meaning with her fragile delivery. She shows that she has still got it vocally as well. All eyes were on Lady Gaga to make a big comeback. The opinions differed a lot when she first premiered lead single ‘Applause’, but the strong pop song turned out to be a success in the charts and on the radio. It is not the best thing she has done so far, but the chorus is great and the lyrics are sharp as ever. Gaga one again showed she is still relevant in the pop world. Florence + The Machine took a break from recording, but still found time to create a song for the soundtrack of the fantastic movie, The Great Gatsby. It is a beautiful song with touching lyrics and of course Florence makes it even better with her impressive powerhouse vocals. The build-up towards the last chorus is very well executed. One more The Great Gatsby track to come in this list! This was one of the biggest hits of the year and probably one of the catchiest hooks that I’ve heard in quite a while. This pop banger works very well on the dance floor and it is hard to resist screaming along to the chorus. It’s is a great track to let off some steam and frustration. Such a deserved worldwide hit for these girls. AlunaGeorge’s first official single is still their best song to date. ‘Your Drums, Your Love’ is a song that is built completely around an immense chorus that gets to you every time you hear it. Aluna’s soft vocals work brilliantly in combination with George’s productions. This song shows off their lovely style best. Pumping beats, screaming synths, smooth vocals and feisty lyrics. These are the four elements that make Charli XCX’s ‘You (Ha Ha Ha)’ into a geat track. The production sounds great and it is so hard to resist singing along to that ‘in your face’ chorus. It still sounds fresh every time I hear it. It is a shame Amanda Fondell did not get far in Melodifestivalen, because ‘Dumb’ is such a great pop song. The verses are even better than the chorus, but the repetition of ‘done/gone’ etcetera, works haunting as well. The middle-eight that almost feels like an emotional breakdown is stunning and her delivery is convincing. I don’t care what the Swedish people voted, this remains a fantastic pop song. Swedish singer Veronica Maggio made a big comeback with her single ‘Sergels Torg’. The lyrics are sad and heartbreaking, but the melody is quite catchy and uplifting at the same time. You do not have to understand a word of what she sings in order to feel the emotion in the last part where she almost screams her frustration and desperation away. Such a heartfelt track, I love it. Anouk gave The Netherlands a spot in the final, and even a top 10 position, for the first time in years at the Eurovision Song Contest. She performed her heartbreaking, cinematic, melancholic and above all gorgeous ballad ‘Birds’. The orchestral sound works well with her voice and the track is grand, moving and captivating. 2013 was a huge year for Miley Cyrus, who transformed into the most talked about pop star with her controversial performances and outfits. However, miss Cyrus has the material to back it up, because ‘We Can’t Stop’ is a brilliant party track. It is insanely catchy and the production is great. Wouldn’t we all like to twerk a bit to this track? I thought so! The girls of Haim broke through in 2013 and their first single ‘Forever’ is definitely one of the best things this year in pop had to offer. The production is perfect, their voices sound wonderful together and that chorus is just undeniable. The track swings and it immediately showed the sisters already found their own style and sound with their first single. Impressive, indeed! With ‘We Can’t Stop’, Miley Cyrus showed she knows how to party, but she also showed her even better emotional side on ‘Wrecking Ball’. This is one of the best pop ballads released in recent years. Miley’s delivery is heartbreaking, especially in the bridge where she sounds fragile and completely honest. The chorus literally hits like a wrecking ball and this all results in one huge pop ballad. Emmelie De Forest managed to win the Eurovision Song Contest in 2013 with her song ‘Only Teardrops’. Although the song sounds tailor made for Eurovision, it has something fresh and contemporary at the same time. Above all, the melody is just irresistibly catchy. The flute, her voice and the drums all complement the strong melody and it made ‘Only Teardrops’ a deserving winner in Eurovision and one of the best tracks of the year. Laura Jansen surprised me with her fantastic single ‘Queen Of Elba’. From the moment I heard this song for the first time, I knew there was something special about it. The lyrics about crowning herself the queen of Elba and coming to terms with a life on her own are brilliant. The melody is lush and her voice is enchanting as always. More of this please! ‘Young & Beautiful’ was the only new single by Lana this year, but it is once again an incredible song. The melancholy in the lyrics fit the sound of the song very well and the movie The Great Gatsby could not have wished for a better soundtrack than this. Lana sounds beautiful and her delivery of the lines “Will you still love me when I’m no longer young and beautiful?” sounds honest and fragile. What an utterly gorgeous song! The best song of the year for me is ‘I Feed You My Love’, the song that represented Norway in the Eurovision Song Contest. From the first seconds on I am captivated by it. It sounds dark and fresh at the same time and the heavy beats and production are definitely ‘in your face’. The lyrics of the song (‘You put a knife against my back and you dare me to face the attack’) fit the dark atmosphere very well and it just sounds so effortlessly cool. Margaret’s voice is perfect on ‘I Feed You My Love’ and I really need her to release a new album soon. Once a year, specialists in music gather for The BBC Sound Of… to predict who will be the acts to watch in the coming year. Last year, they expected big things for the American band Haim. By then, the three girls had only released their first two singles, but it was enough to convince the experts they are the next big thing, as they won the poll. Now, nine months later, their debut album, called Days Are Gone, is out. Haim exists of sisters Alana, Este and Danielle Haim from Los Angeles, California. The girls grew up in a musical family and formed a band together. In 2012, they released their first single ‘Forever’, which created some buzz around on the internet. With this single they introduced themselves in the best possible way, as the song summarizes everything that makes them an exciting band. ‘Forever’ is fresh, melodic, has an immense chorus and above all a completely own and unique sound. More than a year later, it is still the best track on their debut album. This does not mean that the rest of the tracks is not good though. With their next single releases they kept their standards high. ‘Don’t Save Me’, ‘Falling’ and ‘The Wire’ all have the same interesting quality about them. The girls are exceptionally good at writing strong and catchy pop choruses and their songs all have that sound that makes Haim stand out. They mix rock with R&B and pop in a creative and smart way. For a beginning band that just released a first album, it is incredible how fast they have managed to create a sound that is unique and totally fits them. Days Are Gone follows this style on every track, with as a result a well floating, cohesive album. 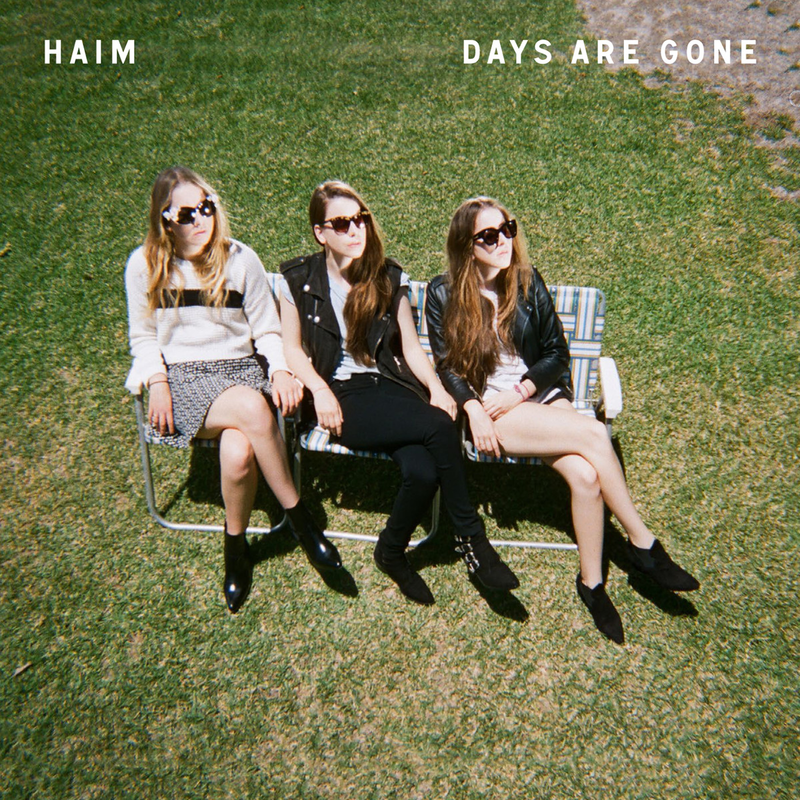 The album never bores or gets samey as the Haim girls still experiment with their style. On some songs the focus lies more in rock music, while others are more heavily influenced by R&B. On the title track, which is co-written by singer Jessie Ware, they showcase a more pop and electro sound, with their own band sound still present. The song is one of the most catchy things to be found on the album. Both the chorus and middle-eight settle in your mind easily and this is not a bad thing at all. On ‘My Song 5’ they experiment with a heavier sound that relies a lot on deep synthesizer and bass sounds, which works perfectly for them. On ‘Go Slow’ they literally slow down the tempo of the album a bit and this lets their amazing voices shine through even more. They perfected their well-crafted sound with great vocals and harmonies. The girls are used to sing together ever since they were little and this really shines through when you listen to their songs. Their vocals blend perfectly together. When having listened to this album all the way through, it seems like the BBC was right. They truly are the sound of 2013 and I hope of many more years to come. Must listen: Forever, Falling, Days Are Gone, My Song 5, Don’t Save Me. Eens per jaar verzamelen de muziekkenners in Groot-Brittannië voor de BBC Sound Of…, om te voorspellen welke artiesten het zullen gaan maken in het jaar daarop. Vorig jaar voorspelden ze een grootse toekomst voor de Amerikaanse band Haim. Destijds hadden de drie dames pas twee singles uit, maar dit was al genoeg om de experts te overtuigen, gezien ze de poll wonnen. Nu, negen maanden later, is hun debuutalbum Days Are Gone eindelijk uit. De band, afkomstig uit Los Angeles, California, bestaat uit de zusters, Alana, Este en Danielle Haim. De meiden groeiden op in een muzikale familie en besloten al jong samen een band te vormen. In 2012 brachten ze hun debuutsingle ‘Forever’ uit, wat meteen al voor aandacht rond de band op het internet zorgde. Met deze single wisten ze zich op een uitstekende manier te presenteren, gezien de song alles bevat wat deze band de moeite waard maakt. Het klinkt fris, melodisch, beschikt over een groots refrein en heeft bovenal een compleet eigen geluid. Meer dan een jaar later is dit nog steeds de beste track op hun debuutplaat. Dit wil echter totaal niet zeggen dat de rest van het album niet goed is. Met hun volgende single releases wisten de dames het niveau namelijk hoog te houden. ‘Don’t Save Me’, ‘Falling’ en ‘The Wire’ hebben allen diezelfde kwaliteit over zich. De meiden van Haim zijn uitzonderlijk goed in het schrijven van sterke, pakkende poprefreinen en alle liedjes bevatten de stijl die de band opvallend maakt. Ze mixen rock met R&B en pop op een creatieve en slimme wijze. Voor een beginnende band die net een album uit heeft, is het indrukwekkend dat ze al een compleet uniek en passend geluid hebben weten te creëren. Days Are Gone volgt deze stijl op elke track, wat resulteert in een samenhangend en goedlopend geheel. Het album gaat nergens vervelen, omdat de dames het niet nalaten om te experimenteren met deze sound. Sommige songs zijn meer beïnvloed door rock, terwijl anderen dichterbij R&B liggen. Op de titeltrack, waar zangeres Jessie Ware aan meeschreef, presenteren ze een sound die meer als pop en electro klinkt, maar met hun eigen bandgeluid ook nog in tact. Het is gelijk één van de meest pakkende momenten van het album, omdat het refrein en de bridge niet meer uit je hoofd te krijgen zijn. Op ‘My Song 5’ experimenteren ze met een wat zwaarder geluid, dat vooral bestaat uit lage synthesizers en een donkere bass. Ook dit werkt prima voor de band. Op ‘Go Slow’ leggen de dames het tempo letterlijk wat lager, waardoor hun stemmen nog beter naar voren komen. Hun sterke vocalen en mooie harmonieën zijn de kers op de taart van een sound die zeer goed in elkaar zit. De meiden zijn het gewend om al vanaf jongs af aan samen te zingen en dit is duidelijk te horen op het album. Hun stemmen passen perfect in elkaar. Na het luisteren zit er niets anders op dan toe te geven dat de BBC het bij het juiste einde had. Haim is echt het geluid van 2013 en hopelijk ook van de komende jaren. Dit moet je gehoord hebben: Forever, Falling, Days Are Gone, My Song 5, Don’t Save Me.